Holiday decorations have sprung up in Kansas City, and so too in Japan. But first….there is only one official holiday in Japan this month – December 23 – Tenno no Tanjobi… The Emperor’s Birthday. This is always a national holiday. When the emperor changes, the holiday will, too. The current Emperor of Japan is Akihito, whom the Japanese refer to as Tenno Heika. There is a small ceremony at the Im perial Palace that is open to the public, but not much more. Otanjobi omedeto! Happy Birthday! Although Christmas is not a holiday in Japan, it is celebrated by more people each year. To be honest though, it is more akin to our Valentine’s Day. Rather than candy canes and sugar cookies, the Japanese enjoy eating “Christmas Cake” and giving small presents to loved ones. 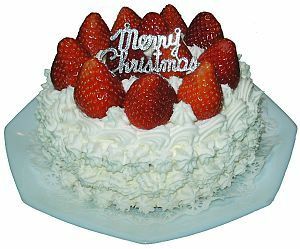 Back in the 1990’s when a woman was unmarried by the age of 25 she was referred to as a Christmas Cake… because they were half price on the 26th… meaning she was past her prime if not married by that age. Fortunately this saying is no longer used as much thanks to the headway women have made in Japan in the last decade. Personally my favorite is Koko Maeda, a film producer in Japan (you’ve seen her work in Kill Bill). I had the pleasure of working with her during the 1998 Olympic Winter Games in Nagano, Japan. She and other determined women like her are putting an end to degrading phrases. Even though the New Year is not yet here – you can begin wishing people a happy new year if you will not see them again until after January 1. “Yoi o-toshi o” “Hope you have a good year” In addition, Nengajo – New Year’s Greeting Cards – are written and mailed at this time. The post office will collect these postcards, but will not deliver them until January 1. This is similar to our holiday card tradition. Many people will make their own postcards, including the paper from milk cartons, while others prefer to have a printer handle them. Japanforms has some free downloads of the cards, but the animal for 2009 will be an ox, not a rat.